One thing that I wasn't quite prepared for when I decided to become a truck driver is the sleeping patterns. I knew fatigue was a big issue in truck driving, but now I truly understand why. The long driving hours are only part of the issue. But the main issue is the lack of any normal "bed time" for an OTRtruck driver. There is a common saying in the trucking industry, and that is; "drive when you have to, sleep when you can." This phrase is spot on when describing the sleep patterns of a truck driver. And in fact, there really is no pattern. The situation is a bit complex, but if you want to maintain high miles every week, you need to make yourself available at the right times. Due to the government's hours of service regulations on truck drivers, we must plan ahead, sometimes days in advance, what we will be doing each hour of each day. If we make our delivery at 6 a.m. withno legal driving hours remaining for the next 10 hours, the chances of getting a load at all that day is slim to none, since most shipments are sent out in the morning. So, the trick is to drive a certain cycle, while trying to remain within the legal barriers of the regulations, so that you have full hours available in the mornings. But unfortunately, as soon as you get into a specific cycle, things change. 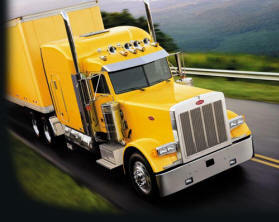 The trucking industry runs 24/7/365 and so do many shippers and receivers. The last couple weeks have been all over the board for me as far as loading and unloading times at our customers. It was 3 a.m. for a load one day, 2.p.m. the next. A 4 a.m. delivery this day, and a 10 a.m. delivery the next. Not only that, but I've had quite a few loads with multiple stops. This only complicates the issue, because you must be sure to have hours available to make it through all of your deliveries and stay within the legal guidelines. On the surface, it doesn't seem too difficult. But in reality, it is. The planning is one thing, but forcing your body to stay awake or fall sleep at different times everyday is another thing. I'm hopingthat as I gain more experience, I'llget a little better at my tripplanning, and can set up more of a routine.I can tell you for certain though, the most widely used drug out here in the trucking industry is caffeine. Walk into any truck stop and go to the front counter. You'll be sure to see several displays of energy drinks, energyshots and even caffeine pills. And my beverage of choice these days is Mountain Dew. Part of the issue for me lately is I'll drive for 8+ hours to my shipper or receiver for an early 3 a.m. appointment, but I can't sleep yet. I have to either watch the customer load or unload the product, listen for my truck number to be called on the CB, or watch the ever so exciting blinking red light at the dock and wait until it turns green. Many customers do have a "wake up" service, but I haven't had the luxury of going to those customers the last couple weeks. Not only that, but the places I've been lately have taken 4+ hours to get me loaded or unloaded. Once they are finally done, it's time to try and find a parking spot. Late at night, this can be a seemingly impossible task. Truck stops and rest areas are jam packed by nightfall, and it can easily take a couple hours to find somewhere to shut down. While waiting at the customer to be loaded or unloaded, most drivers log that time in the sleeper berth. Basically, as soon as they show the sleeper berth in their logbook , they are on their "break." Once 10 hours of break time has been reached, they are able to drive again. But as stated before, shippers and receivers can often take 4 hours or more to finish loading or unloading. So that 10 hour break normally reserved for sleeping, quickly turns into 6 hours. Add on another hour to find a parking spot, another 30 minutes to grab a shower, and maybe if there's time, another 30 minutes to grab a meal. Where did that 10 hour break go? Four hours of sleep is sometimes all you get. Why Not Just Sleep When You're Tired? Obviously, what I just described isn't exactly what the Department of Transportation had in mind when they added the "sleeper berth" column to our log books. Drivers can be their own worst enemies on this front by being "creative" with their log books. Any driver can certainly take nearly as much time as they want to sleep. But this, in turn, results in a very unhappy dispatcher , and a very thin wallet come payday. It's one of those damned if you do, damned if you don't situations. I don't want to spark a debate about whether drivers should log legally or get creative. And my advice is to always drive and loglegally. But my point is, the real world isn't full of truck drivers who log 100% legal all the time. In the real world, most drivers cut into their sleep time, even though they are still working. This is probably the only industry where employees will lie to say they aren't working, even though they reallyare. For those who are about to enter the industry, be prepared to sleep at any time of any day or night, and drive the same way. It could be midnight tonight, and noon three days from now. You might get 4 hours of sleep tomorrow, then 14 hours in a few days. There is absolutely no cycle, no rhythm, and no schedule for when you sleep. Drive when you have to, sleep when you can. On the flip side, when I am able to get a full night's rest, it's always the best sleep I've ever had. It's 4:30 in the afternoon as I write this, and today, that is my bed time. And wouldn't ya know it, I get to sleep for a full 10 hours today!